With SuperNationals V just a few short months away, coach and bug champ Nephtali Diaz talked to CLO about a scholastic favorite: bughouse. 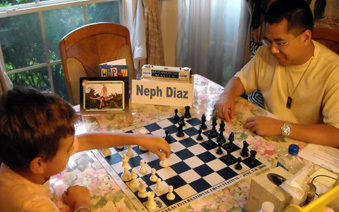 In addition to winning many bughouse competitions (at US Amateur East, the US Open and more), Nephtali maintains www.bughousemaster.com where you can find an excerpt of his book on bughouse. Nephtali talked to CLO about opening tips for beginners as well as his experience in coaching chess, bug and trumpet. Jennifer Shahade (JS): When did you first learn bughouse? Were you immediately drawn into it or did it take some time? Nephtali Diaz (ND): I first learned about bughouse at the Houston Chess Club when I started playing chess there. At first, I wasn’t drawn to it and was actually confused of the subtle differences. It took me quite awhile to understand one of the key differences in Bughouse vs chess: that you cannot drop-capture pieces that you get from your partner, but can instead only drop them on empty, -vacant- squares! JS: What are your proudest accomplishments in bughouse? ND: As a young teen who was a constant 1300-1400 USCF rated player (I never had a chess coach), I never once thought that I would ever be any good at bughouse, nor did I ever in my wildest dreams think I would write a book on it, or give national lectures on the game. 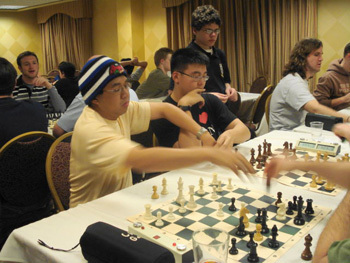 My single best bughouse accomplishment was definitely in 2009, when my partner, Shin Uesugi (also a lightning-fast bughouse player) and I went an undefeated 6-0 in the competitive U.S. Team East Bughouse Championship, ousting many strong teams in the process in one of the most formidable bughouse tournaments in the history of U.S. Bughouse. For example, our 5th round match was against a pair who have both been the highest rated bugger in the world on FICS: FM Daniel Yeager and Scott Low (life master), while our final round match (in which I was able to deliver a mate-in-5) was against GM Robert Hess and GM Marc Arnold. For anyone interested, all 6 games can be viewed online on my website, at www.BughouseMaster.com. JS: What was your most memorable victory? 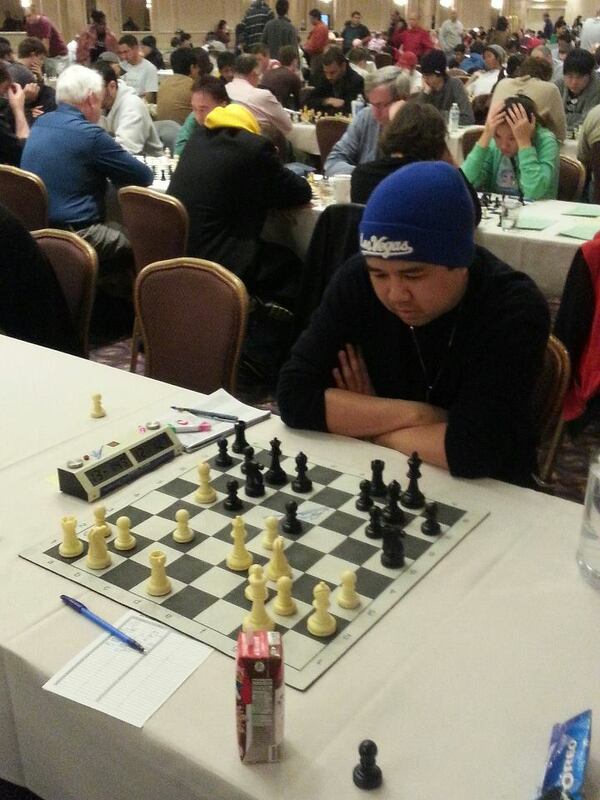 ND: For Bughouse, it would have to be the last round of the 2009 U.S. Team East Bughouse Championship. My partner, super-fast and strong FM Shin Uesugi and me, were matched against GM Hess and GM Arnold and there were no less than 20-25 spectators. Because of our speed, we were ahead on the clock the entire game though, and that certainly paid dividends as I was able to easily sit for the rook I needed to force mate Marc in 5. Surprisingly, he did not know what I was waiting for. For Chess, it would have to be the final round of the 2012 National Open (Under 1800). As both of us were 4-1 going into the final round playing for a top prize, I was anticipating a tough game. However, my opponent, who had black, ended up playing into one of my pet lines which ends up far superior for white and the game was over rather quickly. Because of this, it culminated in my finishing 5-1, tying for 2nd and it ended up being my single best slow-tournament national performance. JS: I see from your official website that you also play and teach the trumpet. I just did an event at the Philadelphia Museum of Art which incorporated chess and music. What connections do you see between music and chess? ND: Well, as they are both part of the “arts”, both evoke the compositional mind. As a tactical and combinative player, these are what I live for in both bughouse and chess. As a trumpeter and pianist, I can also say with certainty that timing is definitely crucial in both fields. If one goes for a premature attack in chess, it often leads to an advantage for the opponent as the position did not yet call for the attack (that is why I tell my students to have at least 3 pieces in the attack first before attacking); similarly, if one is off-beat in music, it is quite evident not only to the musician, but also to the listener as well. JS: What do you enjoy teaching more, bughouse, chess or trumpet? Why? ND: My passion is teaching and improving others to the best of my ability. 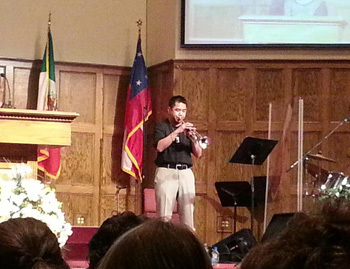 Both bring me great joy and satisfaction and I do not favor one or the other as I love both teaching and performing. JS: Do you teach mostly adults or students? Do you notice any differences in general teaching kids and adults and how different is your approach? ND: That depends on the time of year but at the moment, I teach mostly students. The range of students have been from four years old, to trumpet students over 50. I guess you can say I am an equal opportunity educator. The more difficult concepts, like advanced tactics, pattern recognition, etc. is naturally more difficult for the non-adult, so for those students I tone-down the explanation in a manner that facilitates learning and makes it more easily understandable. JS: You wrote a book on bughouse, which includes opening theory, an interview with Levon Aronian and general bughouse strategies. Tell us a little about it. ND: Ahh yes. After lengthy communication and planning with some fellow bughouse-lovers, we decided to give back to the bughouse community the knowledge we had gained from playing hundreds of thousands of our favorite and most popular chess variant. Along with a few other hand-selected bughouse players worldwide, we co-authored “Bughouse Chess” (feel free to download a free 40 page preview), which contains beginner to advanced strategies, strategy essays, gathering stories, puzzles, and many more. What I enjoyed most however about the experience was giving in-depth analysis of master level bughouse games. It was a real pleasure to collaborate thoughts and ideas with some of the world’s best bughouse players from different continents, including Maarten Aronsson from Sweden, Igor Bjelobrk from Australia, Linus Olson from Sweden, and last but not least: Armenia’s Super-GM Levon Aronian, who is currently ranked #3 in the World at chess! Now who says titled players & grandmasters frown at bughouse? Mr. Aronian is certainly a contradiction of that statement! JS: What opening do you recommend for those starting out in bughouse as White and as Black vs. 1. e4? Does this recommendation change drastically as a player improves? ND: For a new bughouse player regardless of strength, I’d definitely recommend 1. e4 when playing with the white pieces, with natural, developing moves like Nc3, Nf3, and d4 to follow. For black, I would recommend e6-Nc6-Nf6-d5. As the initiative in bughouse is much more important than in chess, it’s very important to develop quickly, and make center-occupying moves the primary goal. I would also recommend definitely protecting the f2 square if playing with white (f7 if black) because in bughouse, sacrifices on f2 and f7 are very common in order to draw out the King due to pieces constantly being recycled. JS: How long will it take a good chess player to be similarly good at bughouse? For instance how many hours of practice approximately do you think it will take a 2200 chessplayer to realize a similar level in bughouse? ND: That’s a tough question because unfortunately there is no set answer. As bughouse games last much quicker than your typical G/60 standard chess time control (casual OTB bughouse games are most often played with only 3 MINUTES for each side and tournament games are just 2 mins more at G/5! ), some experienced chess players just don’t get the “feel” for the speedy nature of the game, and underestimate the importance of being able to drop pieces on any unoccupied square and eventually just lose interest. For example, many 2200+ chess players are more positional and therefore, will tend to make such moves in a bughouse game, if their opponent has many pieces, they quickly become overwhelmed and usually fold like a cheap tent to the impending attack. If I was able to get good, anyone can! Just keep at it! JS: Who do you think the best bughouse players in the World are? Have you played with Aronian before? JS: Who are the fastest bughouse players in the World? ND: Great question. Having played hundreds of bughouse games from all around the nation at the largest venues such as National Open, World Open, North American Open, and various gatherings, I have definitely seen some really fast buggers! However, the most memorable strong + speedy bughouse battle I have ever experienced was when I was partnered with David Chong vs. Todd Freitag & Ben Gradsky at the bughouse gathering in San Jose, California in 2005 I believe. Aside from Shinsaku Uesugi and myself, those 3 were the fastest buggers I have ever played with at the same time. There have been quite a few who have told me that Nils and myself, however, are hands down the 2 fastest buggers in the world. For me, it’s just something that comes so natural and after so many games and years of playing, it has just become second-nature! Playing the piano and typing 150 wpm tends to help too, though. JS: I see on your website that GM Alex Lenderman was so impressed by your bughouse skills that he offered to trade bughouse for chess lessons. Tell us about that. ND: Yes, it’s true! That was in 2009 after he played our team in round 4. He couldn’t believe that someone U2000 in chess was able to play bughouse that well (and frankly, I still don’t know how I was able to become one of the world’s best myself because most if not all of the best buggers in the world have chess rating > 2200!). But to receive that email from one of the top 10 best American chess players was very flattering indeed, and it was a breath of fresh air to have further confirmation that there are still very strong chess players like Alex who are not “bug haters”. JS: I’m pretty poor at bughouse. I play so infrequently that my partner is usually stronger than me, and I sometimes get nervous and down on time, which exacerbates all my problems. What are the biggest tips you can give me? ND: Definitely keep moving! As strong as you are at chess, you wouldn’t have a problem at all playing a natural good looking chess move. Just keep your position solid and if unsure what to do, see what helps/hurts your partner and just keep improving your position (just like in chess). Also the good thing about having a stronger partner is he/she can usually give you some good tips on what to do since communication is perfectly legal in bughouse . Also something to note is time is VERY important in bughouse and the team ahead frequently dictates the action; the person/team down on time is at a huge handicap because it forces that person to make a move, even if he/she is sitting for a lonely pawn to mate! JS: If your partner is playing poorly, how can you best address that without shattering his or her confidence? What are some good and bad approaches you’ve seen in this vein? ND: Ah… that’s what makes bughouse such a great game! The friendly banter is something that is an ongoing routine to bughouse, as it’s something that is very natural – with a game full of communication and a game just like another with always one winner and one loser, it’s just bound to happen. I have definitely had my fair share of hardest and loudest laughs while playing bughouse, and also observing my opponents taking turns blaming/bashing one other on why they just lost the game! To answer your question though, if I do notice my partner playing poorly, I would just encourage him/her to watch more closely at what their opponent is moving, and not to move so fast. Yes speed is important, but making solid moves is just as important. JS: Do you think bughouse helps general chess ability? Why or why not? How much bughouse is “too much” at a major event like a National Scholastic or big Open tournament? ND: Absolutely. I am proof that bughouse definitely improves chess ability. Before, I had no tactical skills whatsoever, and used to just reply e6-d5 in chess against everything. But after playing more and more bughouse and due to the tactical nature of the game/ability to drop pieces on any vacant squares, that opened my eyes to different tactical patterns in chess, and enabled me to see certain mates more clearer too, especially the smothered mate. It irritates me to hear people (normally master chess players or better) make the general statement “Bughouse hurts your chess” just because they don’t enjoy the game! It’s simply a case-to-case basis as it has definitely helped my chess! Too much bug at a major event in my opinion would be anything more than ~30 mins or cutting into resting/relaxation time before the next round. It is definitely the most favorite variant among scholastic players. JS: How can we make bughouse more popular? ND: Hold more competitive bughouse events and demonstrate how it really improves overall chess skill (tactics). I must however give kudos to the organizers who run the annual National Open who did a great job at getting bughouse some popularity a few years back. They held bughouse tournaments and even had the privilege to give the national bughouse lectures at both the Riviera and South Point. To my surprise, the small-capacity room at the Riviera was standing room only, and I received many compliments from attendees who thoroughly enjoyed the first-time bughouse lecture. In the U.S., there are only 2 major bughouse tournaments which offer cash prizes, both of which I have been able to win: U.S. Amateur Team East in New Jersey held President's Day weekend and U.S. Open in August. Having said this it’s just one of those things… if more people in America were interested in chess (like the popularity of baseball, football, or basketball), naturally, bughouse would have more of a following. So chess needs to become much more popular first, because one must know how to play chess first before he plays chess’s most popular variant! JS: What are your future goals? ND: To become a more skillful daytrader, a more polished professional trumpeter, win the World Open, and continue to glorify God and put Him first in all that I do! Also see our latest bughouse piece on CLO, an interview with Kazim Gulamali.